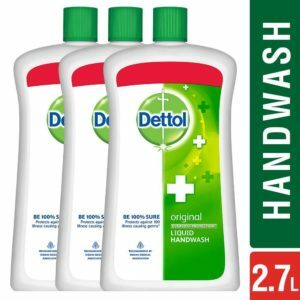 Amazon is selling Dettol Original Liquid Soap Jar – 900 ml (Pack of 3) at Rs 408. It is a very good deal. SO, hurry up!! its a awesome Product. Dettol’s Trusted Germ Protection formula; Protects from 100 illness causing germs. So, Hurry up!! How to buy Dettol Original Liquid Soap Jar – 900 ml (Pack of 3) at Rs 408?